When selecting a wedding getaway car, you’ll want to choose the perfect vehicle that photographs well both coming and going along the Emerald Coast. It will need to be something the bride can get into and out of easily with her wedding gown and something that fits the theme, style and budget of your wedding ceremony. Dripping with class, the ultra-elite Rolls Royce Ghost. This beauty will look stunning in your wedding album from every angle and because it’s a rare treat to see on Destin roads, it’s guaranteed to turn heads. 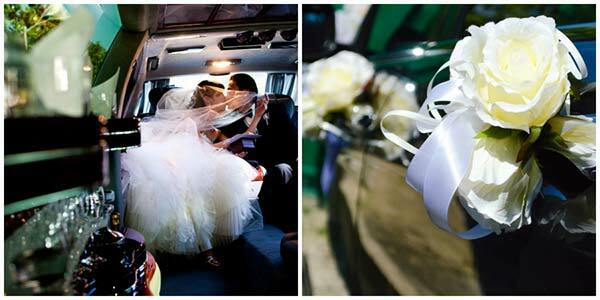 Loaded with luxe leather seats and a properly refined British interior, the lucky couple will be cradled in comfort. The definition of luxury, our vintage 1962 Lincoln Continental Convertible is a choice whose iconic silhouette can be confused with no other. For the ultimate arrival and departure, the Lincoln’s suicide doors open outward, facilitating ease of entry and exit. This classic car was featured in Gulf Coast Bride, Summer 2014! Be prepared to share the spotlight with America’s premier luxury SUV, the quintessential Cadillac Escalade. This sleek performance powerhouse has ample cargo capacity for luggage or wedding gifts. Not a bad way to make a dramatic exit. It’s the perfect choice for heading to the airport – honeymoon bound! Champagne and a “Just Married” sign is available upon request. Rest assured, a courteous, professional, suited driver will arrive on time to chauffeur you in style.